Interior. Canopy release handle painted. I wanted a barber pole motif on my canopy released handle. I originally wrapped red electrical tape on the handle (below), however I figured the tape would eventually peel off. So, leaving the tape applied as masking material, I painted the handle (left) and upon tape removal, was left with reasonable striping on the handle (right). It's not a perfect barber pole, but it makes the point that the handle ought not be trifled with. Here it is on the panel. When I designed my panel, I included four holes for wire ties that can wrap around the handle. This would make it harder to pull the handle for canopy release. Quick post to share how I decided to wire the magnetos. I stole this idea from a post on VAF. Interior. Seating, arm rests, lap and shoulder belts placed. I purchased my seats from Flightline Interiors. You can read about my selection here. The remaining piece, the harnesses, also obtained through Flightline, are from Crow Enterprizes (sic). I have not yet placed the crotch straps as I will wait until the seats are removed from their protective plastic coverings. The carpeting will be the last thing to be placed in the interior so that the pieces don't get dirty. 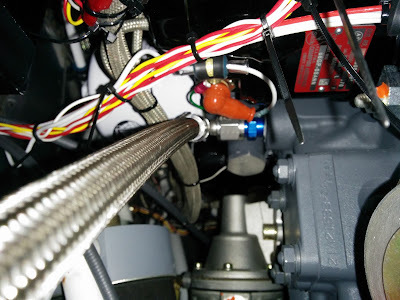 This later post outlines the challenges I had with attaching the harness end fittings into the airframe. The back rest cushions are affixed to the airframe's seat backs with snap buttons, like one might find on a pair of jeans. However, Flightline provides snap studs for the seat backs that have self tapping screws (left). These hazardous, invasive knives were not something I wanted in my airframe. So I went on Amazon to find the right size snap studs (3/8") that I could rivet with LP4-3 rivets (right). Flightline didn't attach the snaps to the back rests with consistent spacing, so the holes on the seat frame for each back rest must be spaced uniquely, meaning the seats and frames are no longer interchangeable once the studs are riveted on. Below you can see the LP4-3 rivets through the frames, rather than sharp self-tapping screws. And now the back rests are ready to be attached to the seat frames. 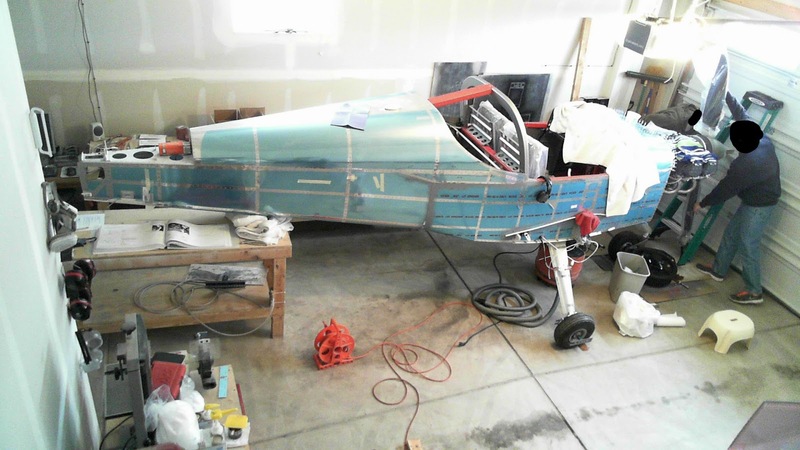 Avionics: EGT and CHT wiring completed. The EGT and CHT wires were installed and routed today. The cylinder head probes are attached via a threaded insert into the cylinder. Left is the cylinder's accommodation for the insert. Right is the insert, inserted. Here are the various wires leading to the right CHT and EGT probes fastened down. Here are the various wires leading to the left CHT and EGT probes fastened down. To test if I wired things correctly, I carefully applied the heat gun adjacent to the sensors. The sensors not only worked, but indicated the correct cylinders as the heat was applied. FWF: Spinner & Propeller. Spinner mounted. I found the spinner a bit challenging in areas, which I will expound upon in this post. Removing the gap fillers was relatively benign. Next was to verify that the backplate had no dishing beyond 0.04". Epoxy is wiped onto the flange contact areas (left) so that the line on the S-602-1 Spinner Plate is visible to permit "blind" drilling through the S-601-1 Spinner. Turns out that even with this glossy layer of epoxy painted in, it's really difficult to see the line on the backplate flange (right) through the spinner. Although not called for in the plans, I deemed it prudent to verify if the spinner would spin true prior to match drilling, using the tried and true method (left) of a sharp marker affixed to a ladder with the former's tip placed on the center of the spinner. Then the prop is rotated 360°. The dot looked good (right) so no adjustments were made. This is another indicator of the quality of the kit. Next the Spinner is match drilled into the S-603 Front Spinner Bulkhead (not shown) and to the Spinner Plate (left). Turns out that I had a hard time keeping the holes on center and even accidentally drilled #19 the holes for the S-606A Gap Fillers (right) - they are supposed to be #40. The latter error caused me to have to replace the entire backplate ($85.43, shipped), necessitating later removal of the prop for the second time (the first being here). Plus, I had to fill in all the holes in the Spinner and Gap Fillers with epoxy-flox. So, on my replacement spinner backplate, I decided not to follow plans. On advice of an RV-9A builder, I instead drilled the required holes into the Spinner Plate's flange prior to placing the spinner. This ensured they were all well centered on the flange. Then I used an angle drill and match-drilled the holes into the Spinner and the Gap Fillers. I believe this is a superior methodology. Also, I did not upsize the screw holes to #19 just yet, because it's easier to place and remove the spinner for fitting (verifying blade pitch and aligning aft edge) a multitude of times with clecos (shows further below). It's worth nothing that Van's demonstrator, N214VA, has poorly aligned holes on their Gap Fillers. You can see this when you view the turntable. They may not have followed the technique I outlined above. Note how the old holes (filled in with epoxy-flox, in pink) line up with the new ones. Gap Fillers with their S-606C Backing Plates. I had one slightly misaligned hole on the Gap Filler shown on the right (second from bottom hole). Next I needed to trim the aft edge of the Spinner to be flush with the Spinner Plate. First, I traced a line to indicate the forward boundary of the necessary cut (top). I then used my Dremel to cut right up against that line (right). Then I used 40-grit sandpaper on a sanding block to bring it flush (bottom). Next it was on to verifying that the blades have the requisite 1/8" clearance when they travel through their full pitch, stop-to-stop. Below shows the two boards I clamped for that purpose. The towel is to prevent marring the blade. Finally, the holes were upsized to #19 and the nutplates were attached.